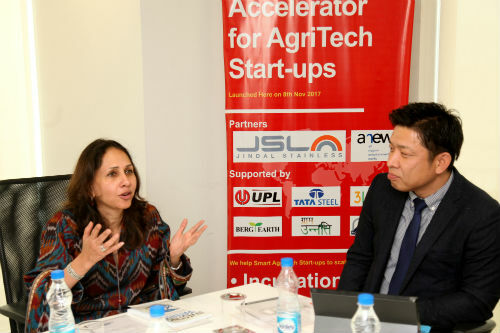 Gurugram: Jindal Stainless Limited, in association with ANEW Holdings Limited, a Japanese Venture Capital, today launched an Indo – Japanese Accelerator Program for Agriculture Start-ups in Gurugram. The Accelerator Program provides agriculture start-ups with a platform for networks and collaborations with Japanese companies, through an intensive program led by experienced mentors from Japan, USA and India. The program was inaugurated in the presence of Mrs. Deepikka Jindal, Chairperson, Jindal Stainless Foundation & Mr. Yuji Fujinaga, CEO, ANEW Holdings Limited. Spread over a course of 3 months, the accelerator program has an intense due diligence process for shortlisting the start-ups from a tall list of applicants. Post the completion of programs, the strategic start-ups may get funding from seed stage investors and venture partners from 3Lines Venture Fund (USA), Rockies Venture Club (USA) and other major corporations from India, Japan and other countries. Through practical orientation at laboratories across intervention areas, these start-ups will get an opportunity to develop farmer need based technology, which will bring down input costs and raise productivity levels. The manufactured equipment’s and developed practices can be replicated in different geographies & manufacturing processes which will yield the desired levels when markets increase and the project goes to scale. Explaining the vision behind the initiative in presence of Mr. Yuji Fujinaga, CEO, ANEW Holdings, Mrs. Deepikka Jindal, Chairperson, Jindal Stainless Foundation highlighted that the ultimate goal is to promote disruptive AgriTech Start-ups across the globe, create social impact through innovations and increase the income of farmers across India. The projects being nurtured are ground-breaking like drone technology, water irrigation systems, machines for spraying fertilizers and many more. Despite the fact that Jindal Stainless Limited has nothing directly connected to agriculture, yet the Company prides itself through this project to engage proactively with farmers in a sustainable manner. Over the past months we have been exploring various opportunities to bring stakeholders together and discuss on how we can develop & share good agriculture practices and also create opportunities for downstream industry to meet the agriculture requirements for specific needs of marginal farmers. With the launch of this program, we wanted to additionally reverse the migration of next generation farmers who are gradually losing interest in farming and looking for alternative options. The Accelerator program is a follow up of JSL’s CSR Project – ‘Project Krishi Unnati’. Launched in collaboration with CII on 8th June 2017 at Bhubaneswar, Odisha it aims to double farmers’ income in the next five years with the initial start from Jajpur district. The project was initiated to demonstrate that despite the majority of economy of Odisha is associated with only metals and mining sectors; a large 4 million strong population was engaged in farming as well. However, farm holdings are small and availability of water for irrigation in the non-monsoon months remained a challenge which resulted in distress sale. Hence as part of the Krishi Unnati project, efforts were being made to increase the farmer’s incomes through a structured process.